To a pot of boiling water, add potatoes and simmer until cooked. In a frying pan heat 2tsp of oil over a medium - high heat. Season the steaks with salt and pepper, and place on the pan and cook as desired. 4 minutes per side for medium rare and longer to cook through. Remove once cooked, to rest. Steam the broccoli and green beans. In another pan on medium heat add 1tsp oil along with the garlic and tomatoes and cook for 5 minutes. Now add the balsamic vinegar, parsley and oregano. Cook for a further 3 - 5 minutes. 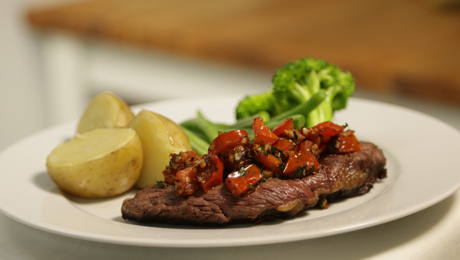 When everything is cooked, place the steaks on a plate, cover with the tomato mixture and serve with potatoes and vegetables.